Have you ever accidentally upgraded your Tableau workbook? We know it can be challenging to work with users across multiple versions, especially when both Tableau Desktop and Tableau Server are involved. In 10.4, we are introducing our new downgrade and publish feature to help you collaborate more effectively and give your organization flexibility in deployment decisions. This is the first of many backwards compatibility capabilities we are developing to help you see and understand your data more efficiently. Downgrade and publish allows users connected to an older version of Tableau Server to successfully publish vizzes created in a newer version of Tableau Desktop. Previously, users could connect to Tableau Server to interact with workbooks, but couldn’t publish from more recent versions of Tableau Desktop due to the version mismatch. 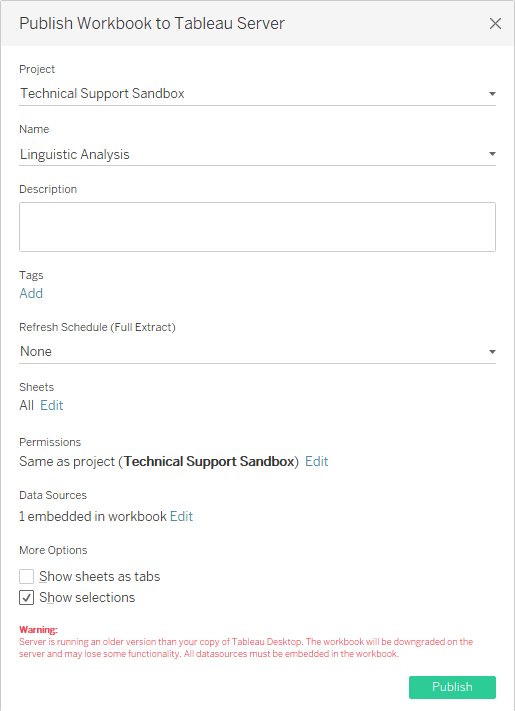 Now, the publishing workflow is new and improved: When a user attempts to publish to an older Tableau Server, the publish dialog displays a message that indicates the workbook will be downgraded to match Tableau Server’s version. Once that Publish button is clicked, Tableau downgrades all content in the newer workbook to match the version that Tableau Server expects. In some cases, newer features may be removed by the downgrade process, so be sure to check your published viz to ensure that it looks perfect (and to make necessary changes if it doesn’t). That’s it! No more manual version comparisons and selections. And of course, if you’re connected to matching versions of Tableau Server and Tableau Desktop, there are no changes to your publish workflow. You only need to downgrade and publish when you are connected to an older version of Tableau Server. Downgrade and publish is shipping with Tableau 10.4, and the feature will support downgrades back to Tableau 10.2. Moving forward, the feature will be compatible with the oldest-supported version of Tableau Server. To take full advantage of this feature, review downgraded workbooks in the browser. Tableau does its best to properly downgrade content, but where brand new features or data sources are used, it may not be able to convert these to older versions. Check the workbook on Tableau Server once it has been published to verify that changes aren’t negatively impactful, and make tweaks, if necessary, to get things looking just right. Another tip: Keep a local copy of your Tableau workbook, just in case. Publishing the downgraded version creates a copy on the older version of Tableau Server, but the higher-versioned one remains on your local machine—keep it around for reference until you can confirm that the Tableau Server copy has been downgraded to your liking. Downgrade and publish joins other major feature announcements in Tableau 10.4. In this release, we’re committed to helping you get the right data in front of the right people, across the enterprise. Data source certifications help organizations promote the best sources for teams to use. They work seamlessly with our expanded recommendations for data sources, which leverage machine learning to suggest optimal data sources for your specific analysis. And for more powerful visualizations, we’ve added linear geometry spatial file support and enhanced the built-in controls for dashboard spacing. This is great! Where is the option to downgrade locally?